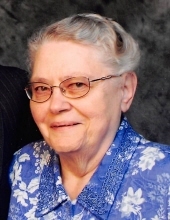 Donna Klenk, 84, of Grinnell died on March 18, 2019, at St. Francis Manor. Funeral services are scheduled for10:00 a.m. Saturday, March 23, at the Smith Funeral Home in Grinnell with Titus Lehman and Chet Stidolph officiating. Pallbearers will be Bryden Jones, Brandon, Brant, and Loren Klenk, Justin McIlrath and Ray Plesek. Honorary bearers will be Breanna McIlrath, Lisa, Melissa, Julia and Emma Klenk. Burial will be in the Rector Cemetery near Chelsea. Visitation will be from 2:00 p.m.to 7:00 p.m. Friday at the funeral home with the family present from 5:00 to 7:00. Memorials can be made to the family for future designation. Donna was born on May 25, 1934, in rural Dumont, Iowa, the daughter of Fred Harold and Bernice Crooks Jones. She was raised in the Dumont area and was a 1952 graduate of Hansell High School. On June 24, 1960, she was united in marriage with Carl Joseph Klenk, at her parent’s home in Dumont. The couple resided and farmed near Chelsea until 1969, when they moved to Grinnell. Donna went to St. Francis Manor in January of 2015 and Carl moved to Seeland Park in June of 2015. At a young age, Donna made her choice to serve God and was faithful to the end. Donna was a homemaker and was devoted to raising her two sons. She was a school cook at Grinnell Senior High and Bailey Park Elementary and later worked at DeLong Sportswear in Grinnell. Donna’s family, friends, and faith were most important to her; she loved sharing her time with her grandchildren and great-grandchildren. Her home was always open to family and friends. She enjoyed baking, sewing, knitting and crocheting. She was active making quilts for family members and tending to her flower garden. Donna is survived by her two sons, Darwin (Faye) Klenk of Malcom and Duane (Beata) Klenk of Boulder, Colorado, five grandchildren, Brandon (Melissa) Klenk of Salt Lake City, Utah, Brant (Lisa) Klenk of Brooklyn, Breanna (Justin) McIlrath of Grinnell, and Julia and Emma Klenk of Boulder; six great-grandchildren, Oliver, Karson, Kinley and Kenedy Klenk, and Mason and Aiden McIlrath; and one brother-in-law, Arlyn Erickson. She was preceded in death by her parents; her husband, Carl in 2017, her brother and sister-in-law, Don and Rose Jones; her sister, Dorothy Erickson; and a brother in infancy. To send flowers or a remembrance gift to the family of Donna Mae Klenk, please visit our Tribute Store. "Email Address" would like to share the life celebration of Donna Mae Klenk. Click on the "link" to go to share a favorite memory or leave a condolence message for the family.